by Levine, John R., Algroy, Jostein, O'Farrell, Michael J.
Levine, John R., Algroy, Jostein, O'Farrell, Michael J. Stay informed, entertained, and up to date - anywhere! Discover the mobile Internet and surf, shop, blog, watch videos, and more! When it comes to the Internet, you CAN take it with you! 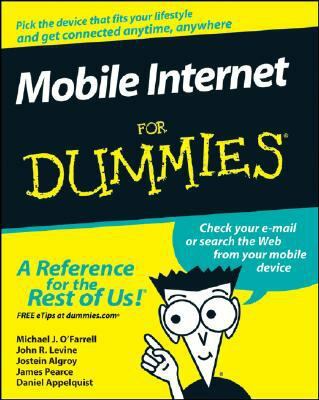 This book is packed with tips on choosing the best mobile device, software, and service provider for your needs, but that's not all. You'll see how to use your mobile Web browser, find made-for-mobile content (and create your own), and much more. Discover how to: Connect to the Web with your mobile device Send and receive e-mail on the go Build your own made-for-mobile Web site Search the mobile Web Manage bank accounts with the mobile WebLevine, John R. is the author of 'Mobile Internet', published 2008 under ISBN 9780470239537 and ISBN 0470239530. Loading marketplace prices 202 copies from $0.01 How does the rental process work?